The Cook Islands are a Pacific Island country of 15 islands spread over two million square kilometres of sparkling Pacific Ocean. The geological history of the islands is of constant fascination to scientists who gain much knowledge from the study of their varied, volcanic origins. While Rarotonga is a raised island cone surrounded by fertile rainforest leading down to an encircling barrier reef, others are atolls.Mitiari, Mauke, Mangaia and beautiful Atiu are raised atolls framed by rings of coral and dotted with caves. Different again, Aitutaki boasts one of the world’s most spectacular lagoons and less land mass, in the form of one major island and many small, idyllic motus. It isn’t known exactly when the Cook Islands were settled, but historians believe that Pukapuka was occupied some 2400 years ago, while Rarotonga’s settlement followed about 900 years later. Cook Islanders believe their original ancestral home is a place called Avaiki. The indigenous people who live on the islands now are believed to have been the remnants of the last great Polynesian Migration which started as early as 1500BC from Asia and whom originally arrived on Pukapuka. European settlement has been varied, with Spanish explorers recording sightings of the islands in the late 16th century. It was another 150 years before another European was to explore the islands and land on one of them, Captain James Cook. The island group takes its name after the intrepid explorer, however Captain Cook originally named them the Hervey Islands. The arrival of the Christian missionaries in the Cook Islands was and has continued to be a huge influence on Cook Island society. The London Missionary Society first sent Reverend John Williams to Aitutaki in 1821, followed by a trip to Rarotonga in the early 1820’s. Teachers of Christianity established many rules and regulations, as well as a strong base for the religion during the 19th century. 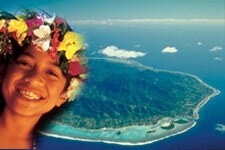 Christianity is still a strong social force in the Cook Islands today. A British protectorate from 1888, and subjected to less than successful British residents through the late 1800’s, the Cook Islands eventually became a New Zealand dependency in 1901. Some 60 years later, the Cook Islands became a self governing state, with foreign policy and defence still under the control of New Zealand. This close relationship continues today with Cook Islanders sharing New Zealand citizenship. This means there are now more Cook Islanders resident in New Zealand than living in the Cook Islands themselves. In more recent history, tourism has become a major income for the islands, both from non-resident Cook Islanders returning to visit family and numerous visitors from international destinations. Visitors continue to enjoy the tropical climate, relaxing atmosphere and traditional hospitality of the Cook Island people.